GM already released one of their four Super Bowl 2012 ads with the funny Chevy Super Bowl Ad titled Happy Grad. Besides the massive Super Bowl ad line-up of four ads, GM also just released an app for the Super Bowl that gives you chance to win one of 20 Chevy cars among tons of other prices from Papa John's, Sirius XM, Bridgestone, Motorola, and NFLShop.com. The Chevy Game Time App is asking live trivia about the big game and you get the most up-to-date stats. The app lets you unlock exclusive content, and much more. This app is a great way for GM to keep Super Bowl viewers thinking Chevy during the compete Super Bowl. Using devices like the iPad and iPhone while watching TV has become a pretty normal thing. 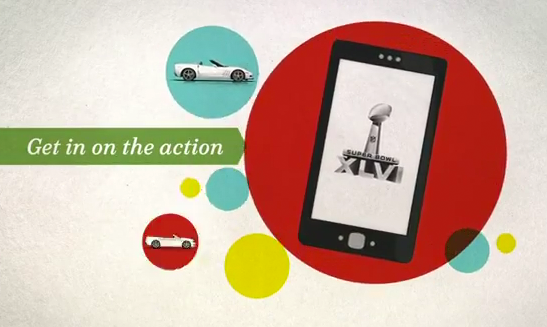 It totally makes sense for advertisers to also occupy those devices during the Super Bowl. Besides playing Chevy Game Time you should also of course visit Super Bowl Ads for Geeks for up-to-the-minute coverage of Super Bowl ads 2012. We will provide all Super Bowl 2012 ads online and offer commentary and rankings. The Chevy Game Time app is available in the Apple iTunes App Store and the Android Market. This means you can play Chevy Game Time on your Apple iPhone and iPad and on Android smartphones and tablets. Watch a promo video for the Chevy Game Time App below.